Become a rock star playing our infrared air guitar. 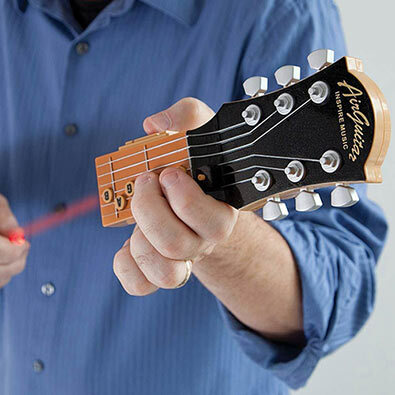 Simply press on the chord buttons while strumming the air. The infrared sensors detect your hand motions and play the notes to your beat. You can play all the chords with the built in speaker or play along with 10 preset songs. You can even connect to your music player or external amplifier. Contains earphone jack and runs on 2 "AA" batteries, not included. Measures 21cm x 9cm x 4cm. Recommended for ages 13+. Become a rockstar with our electronic drumsticks. The built-in speakers include a melody mode for rhythms and background music, cymbals, snare and tom-tom drums. Each drumstick tip lights up with every beat. Measures 35cm long, requires 2 AA batteries for each drumstick, not included. Recommended for ages 7+. Using innovative chord playing techniques you can sit down at the piano and simply play in just six weeks. Each lesson contains several exercises, sheet music, practice advice and evaluation. 128 pages. Spiral bound. Soft cover. 20cm x 25cm. The most accomplished artist and aspiring beginner will enjoy the ability to play piano anywhere with this lightweight portable piano. This 49 key standard keyboard creates 100 different rhythms and tones and features 10 demonstration songs, LED display and built in speaker and volume controls. You even have the ability to record and play back your very own songs. Also includes plug-in jacks for earphones and powered speakers or amps. Best of all, it rolls up so you can take your keyboard to any gathering or even on vacation. Measures 80cm long. Requires 4 "AA" batteries, not included. Manual included.